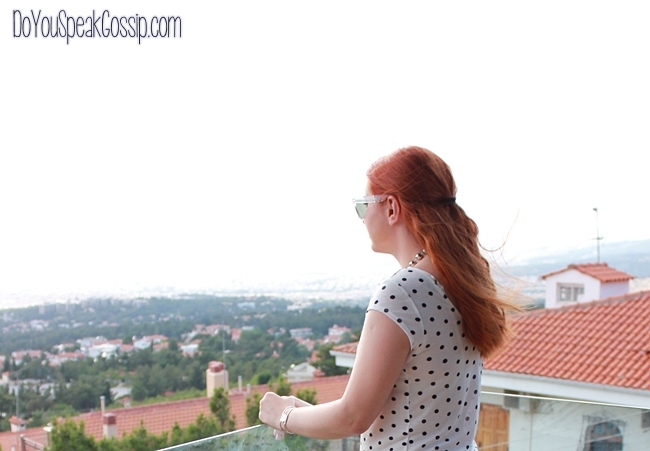 Esprit Archives - Do You Speak Gossip?Do You Speak Gossip? Neutrals, neons, and florals for a really hot day downtown, which ended with – what else? – a thunderstorm. Seems like the whole month is going to be like this. I rarely wear florals, but I guess it’s nice in small doses, and only for my upper body. The same goes for neons. I love my neon yellow bag, but it gets too many stares when I take it out. Ah, who cares? I’m so tired of getting stares for being more dressed up than the 95% of my city’s residents. I’m not feeling like myself when I’m not in heels and there’s nothing wrong with wearing a bit of a color during warm months. Do you agree? We had a really small window to take these photos just before the sun went down on this cloudy day. I was thinking about wearing these sandals to the wedding I attended, but I decided to go with the other pair. But I couldn’t get these shoes out my head. I bought them last summer, with their black twins (both from Buffalo), and they must be one of the most comfortable pairs I own. This type of shoes seems to be the best for summer. Comfortable and leaves my feet blister free. It’s a huge plus, because all summer shoes “destroy” my feet. The fact that they’re so stylish and high makes me love them even more. Do you like this otherwise casual and laid-back outfit? I was really comfortable, I swear!